The Champion Sports Bowling Backstop brings the bowling alley to you. Set it up on the driveway and sidewalk, or in the yard or basement for instant bowling games for your friends and family. We designed this backstop specifically for bowling, which will help you refine your game and continue to improve your score with repeated use. Pick up sets of our rubberized, plastic, or Rhino Skin weighted bowling balls and pins, then unfold your backstop, and get to bowling! This net’s wide stance and strong mesh accommodates multiple bowling sets, making it the ultimate versatile accessory whether you’re engaged in competition with your friends or simply practicing on your own. Quickly and easily set up your backstop to start your game or practice whenever you want. With a convenient design, this one foot high high net will spring to life when you’re ready to play, made with durable mesh netting to withstand hard rolls. Then when you’re done, two folds and you’re ready to slide it in the closet or hang it up for your next game. Fold it and take it with you. You can train at home or away with this foldable backstop, the perfect size for young athletes and active families. Practice your strikes and techniques without worrying about the ball and pins rolling away. Add another dimension of with our brightly colored sports accessories. 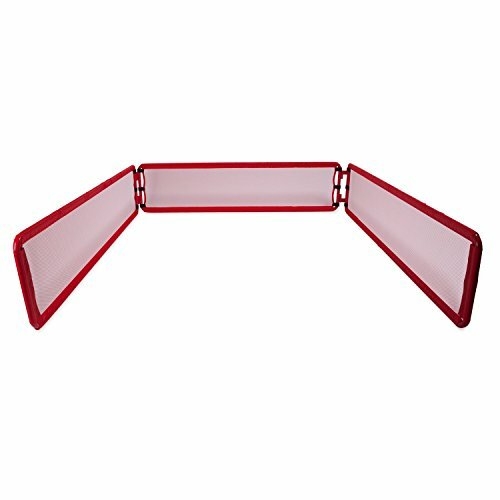 Our bowling backstop is coated in bright red to provide an easy to see target as well as draw a high contrast to your bowling balls and pins. Pair with our bright white, yellow, and multicolored pins sets for the ultimate bowling experience.